I got some pieces from throughout the last year I could give. 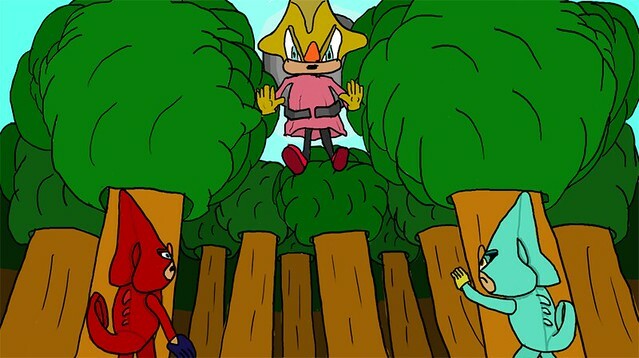 And I'll start right off the bat with two video game inspired animations that I made during my first university year. This first one is more animatic than animation, but I was pressed for time. But it gives a good look at a 16-bit art style I was using for it. Only output at ten frames, it was going to have double the amount of seconds to it, with the upper half of the park in question included. This second one features double the amount of frames per second, over four times the amount of seconds in it, and again finds itself unfinished in terms of the brief. Still based on video games, it took a lot more to make this than the previous animation, and featured more of what I wanted to do in the first one. There's a link in both of those videos leading to the full info, but I at least wanted to give a summary here. Oh yeah. Bonus. Larger picture of the one in the left of my sig. Won't say much about it now, but its basically an advertising banner for a fan fiction I'm currently running. Last edited by DarkRula on Sat Jun 04, 2016 2:40 pm, edited 13 times in total. The second animation is a definite improvement technically on the first one, and you've clearly put a lot of work into it, so good stuff! Keep it up and I'm sure it'll just keep getting better. It's definitely nice to see some original animation on here. Thanks for that, OrangeRakoon. I'm definitely going to keep at it. Most of the stuff I'm doing at uni is just tests though, and on paper at that, so I'm waiting until that's all done before uploading. Another bonus picture. 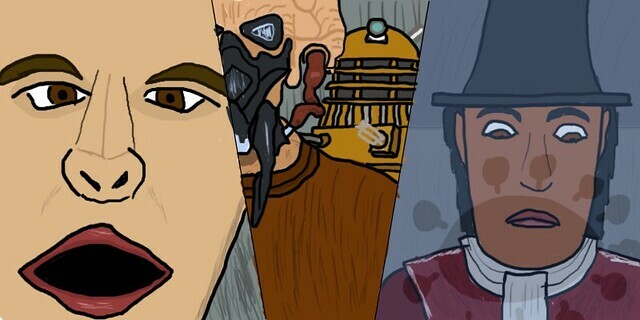 Star Wars-Doctor Who related, three custom characters looking on the same scene from different areas. I'm pretty sure we all know who's about to be toast. Last edited by DarkRula on Thu May 28, 2015 2:53 pm, edited 1 time in total. So, no posts for two months. I've been busy. Completing this. I was meant to post it two weeks back, but... holiday's and birthday made me forget. The animation is something which was completed by me over the course of a month for university. 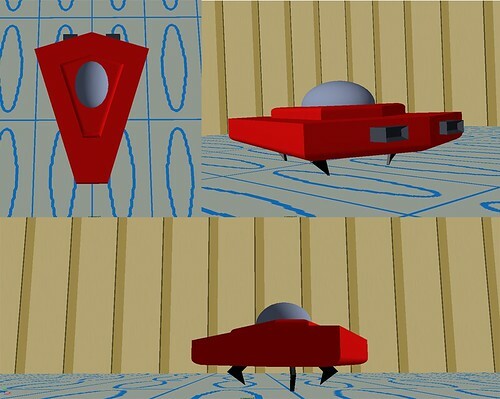 Created in Toom Boom Studio, a first for me, the basics of the brief was making a short animation by using an object. It could be anything we wanted, so long as it short and used an object. And so I used the shoe idea for simplicity. My advice for anyone learning animation is to keep drawing, and as much as you can. Experiment with styles (study your favourite artists, from life etc). Stronger art, stronger animation. Study it hard and well. There is literally no better book to learn animation from. I keep pulling mine from the shelf from time to time. Thanks for the advice on all three. The first animation's walk cycle was placeholder and nothing more. I'd spent so much time designing the backgrounds that all I had to use for the walking itself was the placeholder. With the second one I didn't want to overcomplicate things, as that was my first proper attempt at both working with walk cycles and working with perspective. And again, I'd spent too much time designing the backgrounds and such. The shoe animation - let me reiterate on that. The entire work was done in a month. Starting planning to finished product. And considering it was only meant to be ten seconds, I sort of pushed the boat a bit. In fact, the only last minute thing with the shoe animation would be the music itself. I was going to do sound effects for both the shoes landing and the emotion, but that got dropped as I needed it finished. As for the title card, I was half and half on using that, but thought it couldn't do any harm except add more time. As for the book, already have it. Thanks for all the advice. It's always welcome. First update of the year brings two things, though neither are animated. The first is in relation to modelling in Maya. In the last few weeks of the animation course, we've been learning the deeper mechanics of Maya, and modelling within it. Away from the work, I made this spacecraft. I'm hoping to do more with it, even if it is just to use it as a base to get angles right when 2D animating. The second is related to Sonic the Hedgehog. Team Chaotix. It really came from nowhere. I was just doodling on paper, saw another one of the chameleons I seem so fond of drawing, and decided that maybe it was time to draw The Chaotix in full. And so that's all three of them. 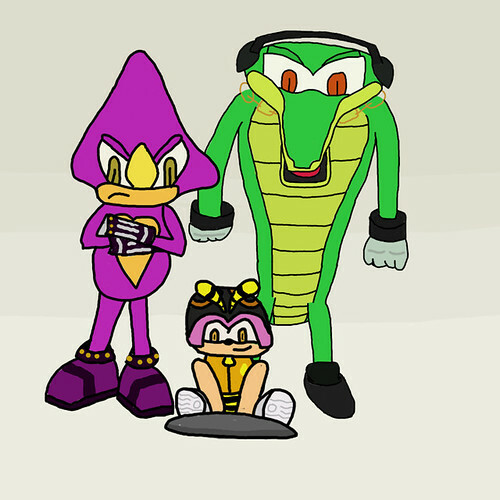 Espio, Charmy, Vector. Each was drawn individually, and then put together on one new page and resized appropriately. There should be more on the way soon. And so I bring today something animated. Something special. Something festive. Happy Easter to you all, and enjoy the E-Card. Good to see this thread still going! This is the last project to have come from Year One of the animation course. It's a 2D cut-out kid's TV program opener. The concept is a program that shows the lives of animals that live in the forest. It would feature simple challenges that the particular group of animals [of the episodes focus. Only one animal would feature per episode] would have to overcome. Finding food, digging a tunnel, that sort of thing. For the opener, I wanted to feature all the animals that would feature in the season. For movement itself, I didn't want to overcomplicate things, and so there are only a few poses per animal. Those include movement, hence the LEGO-inspired walk cycle of the hedgehog at the beginning. The music was composed by me, using simple piano and sound apps. If you want to know what I was aiming for, I think you can guess the name of the song from Animal Crossing I was using as inspiration. The bee and sniff sounds were done by me, for the owl I used Find Sounds and edited what I found a bit. I've definitely been doing a lot over the course of the year, and like I said. Now it's the summer, I should be able to get some more original stuff done. No animation for this update, but after the devastating loss of an influential man within the gaming world, and everyone paying tribute in someway, I put my focus on to this. 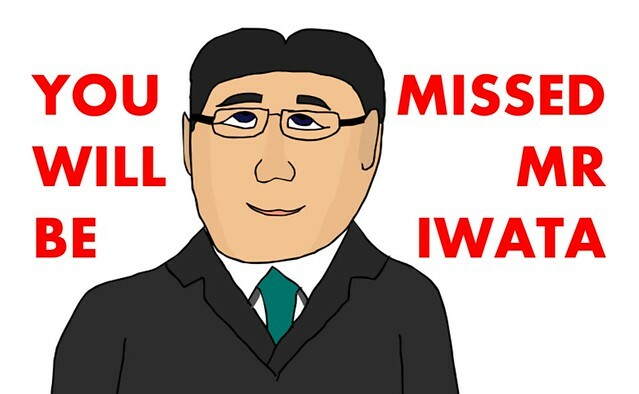 This is a drawing of Iwata-san I made, and it is used a header to the short story I wrote - entitled 'His Spirit Lives On'. In terms of animation, I find myself trying to find a decent way to work for long periods of time now I don't actually have a solid surface to use with my tablet with. Still experimenting every so often, however. Still looking into things. EDIT: And Orange Rakoon, it's great to hear you say that. So thanks. CDS have you done any new Animation's this month. I wanted to do something like this for quite a while, and mid-way through August I put the plan into action. It is simply two spacecraft taking off from a hangar to fly into space. It was going to be part of something bigger, but had to break off doing so to plan some sort of sequence to follow. You can see what I have, and hopefully more is added to it soon. Unlisted, though it might get put to public soon. CDS Do you have anything like new Animation's. Right then. I just thought I'd come in here after two months away to say that I expect to have something every month owing to something we were introduced to last month at university. That is the 11 Second Club, a monthly competition held for animators to showcase what they can do in short sequences using pre-found audio files. It's on Vimeo so that I can save my Youtube from being full of them. Instead, I feel adding four of them quarterly would do better. Progress on other uni work is going well, and I might just have time to slip a bit extra into my schedule as well. CDS are you gonna do more fight scene's Animation's. That will largely depend on if I have time between other things. Just like with Easter, I plan to do a Christmas themed e-card. Snowball fight seems the perfect theme. i've thinking about doing a mii christmas ar story next month and may do a christmas Animation next month. Nice. I'll look forward to what you bring out. i've thinking about doing some of the mii christmas ar story this month. As always, advice is helpful, and the next one will be posted in a month, unless I add something else before then. I've got some idea's for the mii christmas ar story also gonna take picture's later. CDS I've got idea's for the next mii's easter ar story and i will do the mii's easter ar story in march. Well... this needs a bit of an update. A new animated short from university, it's also something I've wanted to attempt for quite a while. When a problem goes wrong with a handheld console, the player gets sucked inside and must escape. The only problem with that is that every action causes the game to swap. Can he escape? Live action segments at the beginning and end feature me without glasses. I'm slowly working on uploading everything from the year just gone, so expect another update very soon.